Whenever I plan to buy skincare product, I never skip to list for my face, neck, hand. But what I leave out most of the time is the product for my feet. May be to slash down my budget I prefer to skip the most important part of the body. How stupid I was. You may spend few hours for pedicure once in a month. But don’t forget to use up twenty minutes from your busy schedule every week to pamper your skin with foot soak. 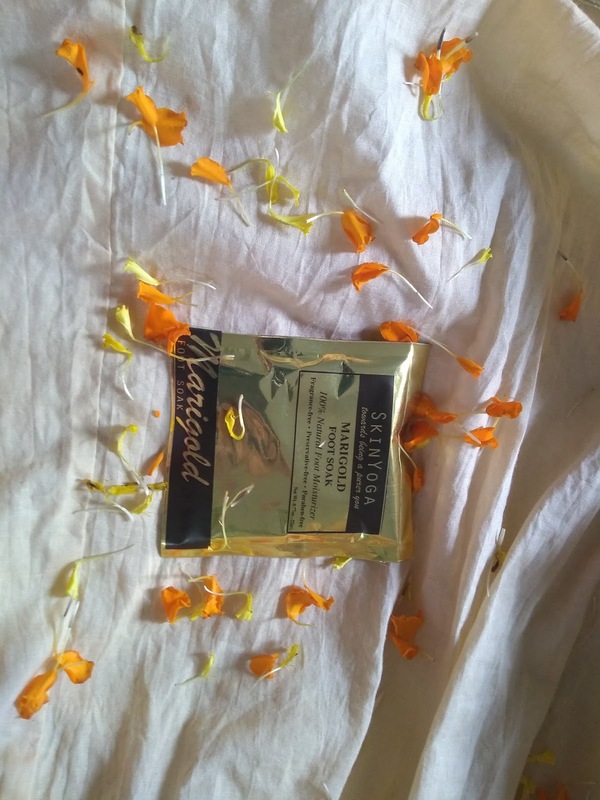 In this post I am going to share my experience with Skin Yoga marigold foot soak which I get as a free sample from Smytten. But before that I want to pen down few words about the advantage of foot soak. Foot Soak works wonderfully as a relaxing agent for our feet by soothing tired muscle. Removes dirt, skin tan, heals cracks and other infections. 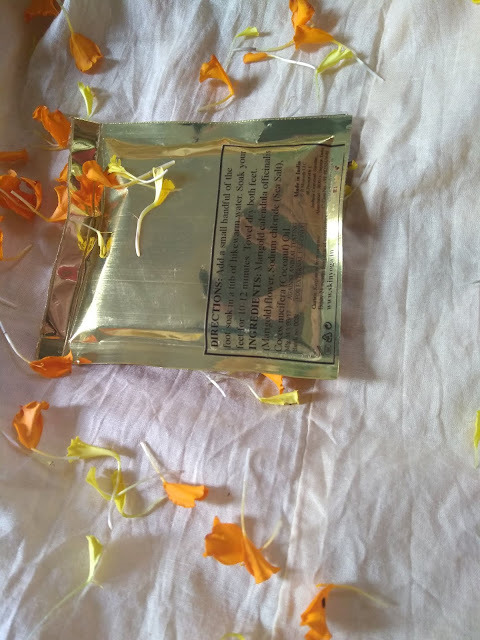 It comes in a neatly packed beautiful golden sachet. When I unpacked it I found golden granules with marigold petals. I emptied the whole sachet into the tub filled with lukewarm water. I dipped my feet into the tub. Coconut oil was actually hydrating my skin by making my feet soft and supple. 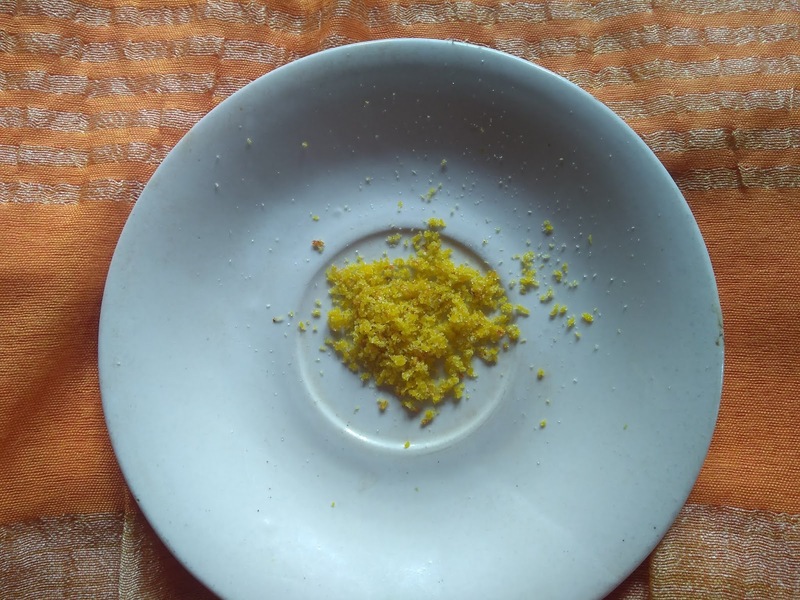 The salt granules acted as a very good scrubber as it demands to remove Suntan and dirt. Marigold is an excellent coolant that helps to relax tired muscle. I dipped my feet at least for 20 minute and it really helps me to relieve from pain.